Pseudopelade is a form of patchy hair loss often confused with alopecia areata. Its exact cause is the subject of medical controversy, with some specialists arguing that it can develop from more than one type of underlying problem. Nevertheless, it has a distinct pattern of development. Although it can be difficult to treat, knowing you've got it means that you can avoid unpleasant treatments known to be ineffective and you can plan better for coping with your hair loss. The early symptoms of pseudopelade are easily mistaken for alopecia areata, but have some distinctive features. Patches of hair loss usually occur on the crown or in places where the hair naturally parts. They may be small at first, so that it seems the hair is just thinning (as most people's does with age), but over time they become distinct. They may be reddish in colour and the skin may feel slightly swollen. Because pseudopelade can be confused with other conditions, your GP will usually want to do a biopsy before making a firm diagnosis. This involves removing a small patch of affected skin from the scalp. It won't leave a scar and may even reduce the size of the patch as healthy tissue is drawn together from either side. Pseudopelade is much more common in women than in men. Occasionally it affects children. It is believed to be caused by a problem with the immune system, something which is a bigger risk for women due to developmental differences and the influence of the hormone oestrogen. It is most common in the prime of life and the risk of developing it subsequently decreases with age. Our bodies protect us from some times of infection by producing antibodies against invading agents like viruses. In people with pseudopelade, the body develops antibodies against parts of the hair follicle, failing to recognise them as legitimate parts of the body. People with lupus can experience similar symptoms. If you develop pseudopelade symptoms you should advise your doctor of any other immune problems you may have, such as eczema or asthma. 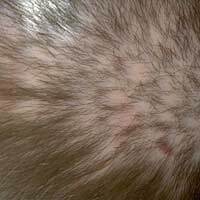 One of the easiest ways to distinguish pseudopelade from alopecia areata is to look at which part of the hair follicle is affected. Pseudopelade causes inflammation in the upper part of the follicle, right at the surface of the skin. This gradually shuts down the follicle's ability to produce hair until it is covered by a layer of fine scar tissue, at which point the inflammation subsides. There is no natural process of recovery from pseudopelade, but it is rare for it to affect the whole head. If untreated, the patches gradually spread out and then stop. Once they have stopped growing, the redness at the edges should fade and any associated physical discomfort disappears. If you want to cover your pseudopelade patches with hair patches or extensions, it is best to wait until this stage to do so, though in some cases the process can take several years. Because pseudopelade is caused by an immune overreaction, the best way to treat it is with immunosuppressant medication. This kind of treatment is risky, however, because it can have unpleasant side effects and can leave you more vulnerable to common illnesses. Your doctor will not normally agree to it unless you have other serious autoimmune problems. In some cases, where the disease is not very advanced, it can be treated using topical steroid medication like that used for eczema. At this stage it can also be possible to use a short course of immunosuppressant medication to halt the disease in its tracks, after which you can go back to normal, but you should keep paying close attention in case symptoms return. Unfortunately, once a patch of pseudopelade is fully developed, there is nothing you can do to recover the lost hair. Standard hair restoring treatments will not work because the follicles are beyond repair. There is no scientific evidence to show that natural remedies can treat pseudopelade effectively, but there are still a few which specialists recommend to those who don't want to take standard medication or find it ineffective. These work by reducing the swelling caused by the disease. This in turn reduces swelling in the follicle and may mean it can survive for longer. The most commonly recommended treatment in this situation is juniper oil. You should never apply this directly, as it can burn the scalp, but you can buy ointments and shampoos that contain it. Ginseng and aloe vera are also believed to help.